For some reason the pictures we have right now beg for waiting rather than publishing so I am not and have not done a picture blog for the past few days. I will be sharing pictures again, just waiting for critical mass. Sometimes the pictures inspire something that isn’t quite there yet (not enough pictures) so for now we will wait. The boys and I on the walk were discussing the new LOTR films. I actually posted my full thoughts on the films including the hobbit on my other blog. First off let me say that 16 year olds are a blast to walk with. They have ideas and concepts now, understand a little of the world ahead of them and they both read like crazy. Its fun to listen to how they think through things. The discussion on the LOTR and Hobbit films was a blast. I can’t tell you, on our walks, how many cars have cut us off as we prepared to cross the street. First off, DC and Maryland both have pedestrian laws that say we are always right. Plus if we are in the crosswalk they have to stop, period. Yet they cut us off nearly once a week. The driver looks back at us with an apologetic look but its bad. I wish someone could convince DC area drivers that driving a car means you can injure someone. I am loving the smart car so far. It doesn’t do as well in wind as the Mini-Coopers do, but to date (2 full weeks) I am averaging 44 miles to the gallon. THa tis a 20 mile per gallon improvement over the Minis or basically almost a 50% reduction in fuel charges. Add to that gas prices at recent lows and I am saving nearly 70% now over what I was spending in the summer for traveling. Plus I was hating where I was going in July. So it’s a good thing. My favorite talk radio show is Mike and Mike in the morning. What do we need to do to get ESPN to make them an all day everyday show? I love the way the show is, the humor and the fun way they discuss both sides of many sports issues. Installed a new router, should have been bang-bang and instead frankly it has been a pain ever since. I am at 60% functionality. ARRRGGGHH. There is no I in team. But there is an I on the teams I am on. I posted a why are meetings hard post on Linkedin. (link is here). I find it hard to understand why specialization sometimes produces broad expertise. You focus on one thing and suddenly everything around that one thing is in your core expertise. Seriously? Specialization means you are good at the one thing. Everything around that one thing is your IMHO. You aren’t an expert. Geez. I can’t say how much that drives me crazy. To talk you have to listen. To listen you have to hear. Driving isn’t a blood sport. What did I do with all these random thoughts before I had a blog to post them on? Or was I saving them waiting for a blog so I could get them all out and at some point there won’t be any more in my head? I wonder. Like I said picture blogs will return after a brief Hiatus. The family history project is marching on. 6600 pictures scanned. 10870 slides scanned. With the one’s we haven’t started on and the ones we still have coming I suspect we have 15000 scans to go. So we are well past 1/2 way. The minions groan when I tell them there are more pictures coming. But someday, when they want to remember their childhoods or moments that were long forgotten they will have the images to do so. Perhaps I should write a book called the 10 scans of when you were little. and yet dust is all we hear. it is in that we find the voices. Is that fear we feel? as the squirrel darts up a tree. 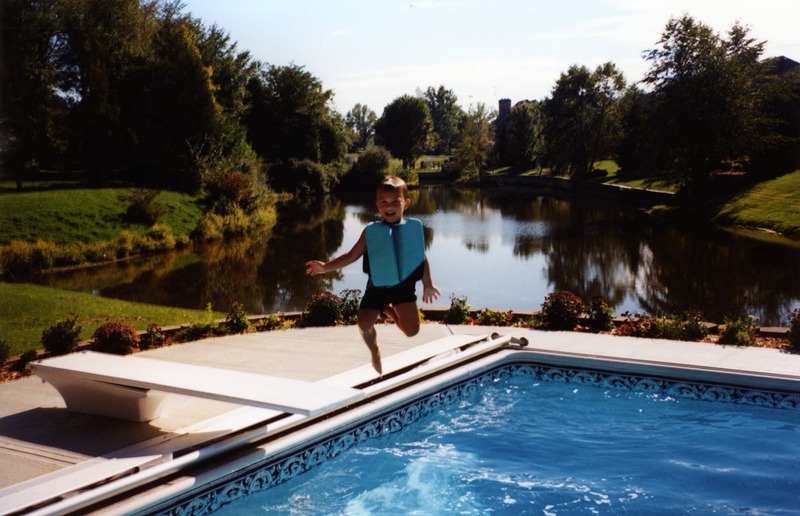 My daughter was able to catch the pictures of me falling into the pond when we lived in Indiana (nice…maybe). She reminded me of my falling into the disgusting pond water many times. So I thought I would put this up for her entertainment. 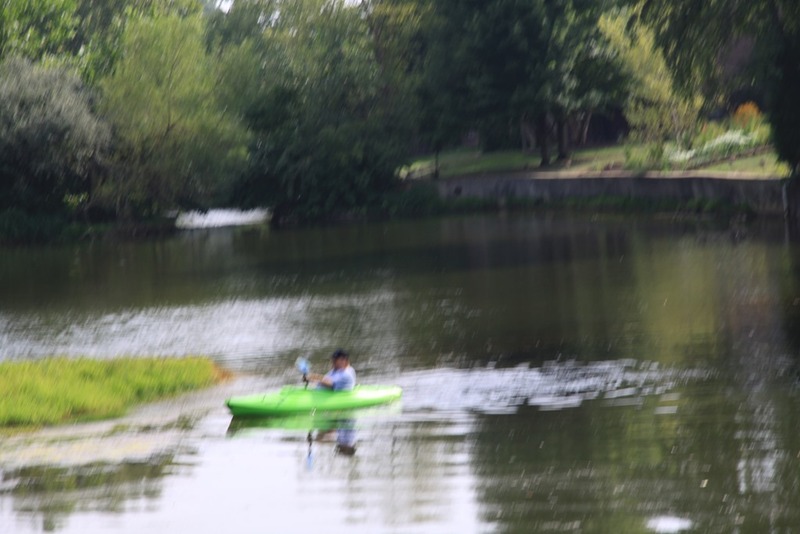 When we got the kayak I thought it would be fun to roll around the pond to test it out. Sadly I ended up in the disgusting water. Which by the way not only smelled but of course was populated by snakes that love to bite humans (brown water snake) and large alligator turtles. I went down in the shallow end near our house. It was filled with construction dirt from the subdivision that was about a 1/2 mile away and had just finished the last house. The dirt sadly had moved along the creek into our pond so we had a sand bar at our end of the pond. I hit the sandbar with the front of the kayak and went over like a log. This picture is from Andersen Mission control right before we launched the rocket. It actually flew better than the model predicted or the 8 year layoff from the last time I launched to this launch was worse than I thought. I suspect the latter but you can never be sure. 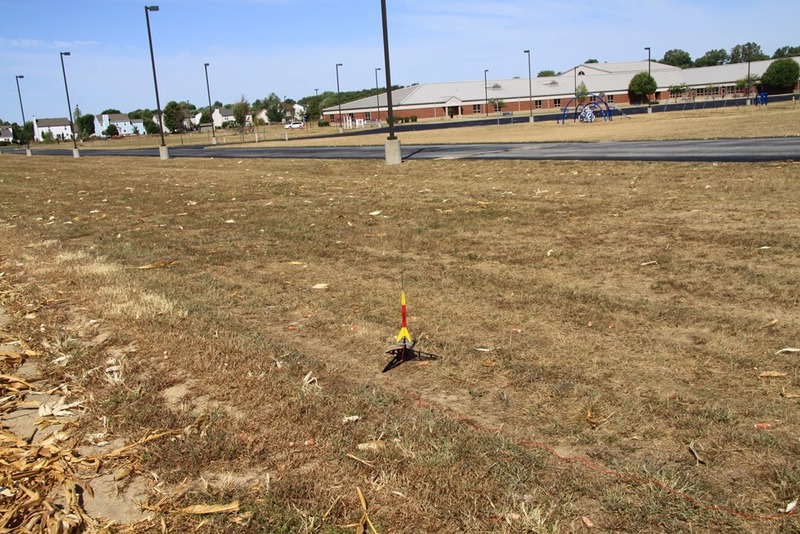 We ended up clearing the entire field and passed over the boys Elementary school with our first launch. It took us nearly an hour to find the rocket. Mostly I think he wind was blowing harder than we originally thought. I had input a 5 mile per hour wind into the calculator and in the end I think the wind was closer to 10 mph. That difference made the landing calculations off by roughly 25%. The wind mostly affecting a rocket after the parachute deploys. Still it was a blast. Our first launch as a family. For me it was my 100th or so launch including school teacher launches and personal launches. Here is a great picture of Nick. He is the mechanical take things apart kid. He loves trying to figure out how things work. He struggles sometimes with the why people do things part but he loves the simple reality of putting things together. Its fun to watch him figure stuff out. This picture was taken about 10 years ago and is from the back porch of my parents old house in Bloomington Indiana. Noting the clothes I suspect this is a late spring/early summer event that was held at the house. Mom and dad hosted the major family events at their house. In the beginning we lived in Cincinnati (about 2.5 hours away) so we were always the late ones to events. Later when we moved to Greenwood it was less to travel but we were still always the late ones to family events. I guess late doesn’t always mean distance was involved. Not sure why this picture caught my eye but it is pretty cool. During the scanning project of my dad’s slides I posted a picture of my sisters and I on the steps of the Royal Palace in Bangkok Thailand all wearing our cool sunglasses. 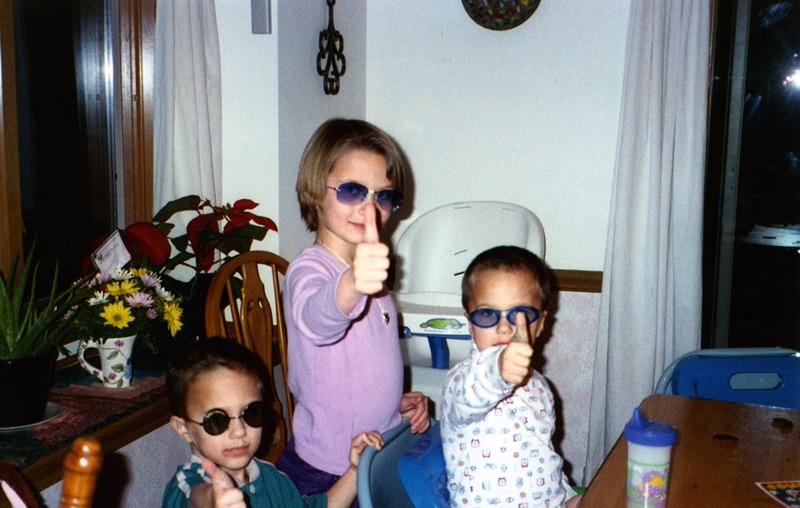 Here are the three kids all wearing their sun glasses and of course giving the world the thumbs up sign. The picture was taken with the boys and Jakki in the kitchen of our house in Greenwood Indiana. The wooden window shelf behind the kids is the dead give away as to the location. I suspect this is a posed picture rather than a captured spontaneous moment. It would have been much harder to catch them doing this by happenstance. Similar picture but in this one Jakki is posing with two rabbits. 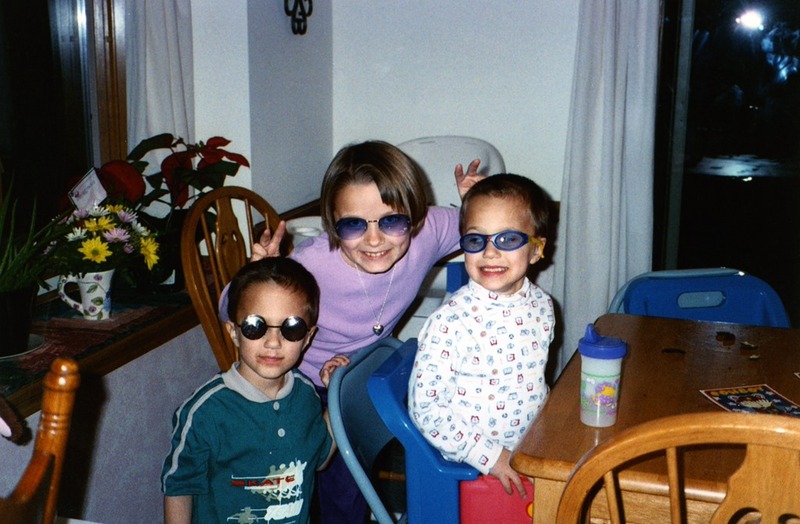 I don’t know where the boys went from the other picture of which was first – Jakki and the Rabbits or Jakki and the boys in cool sun glasses. If Jakki ever decides to start a rock band she will have to call it Jakki and the Rabbits. That is the coolest rock band name ever. Probably (again) a posed rather than spontaneous picture. Mostly because the boys never stood still long enough to take a picture when they were in motion. Twins can be perpetual motion machines. This one is ironic more than anything. A picture taken of Nick standing in front of the couch. Fran and Luke were lying on the couch. 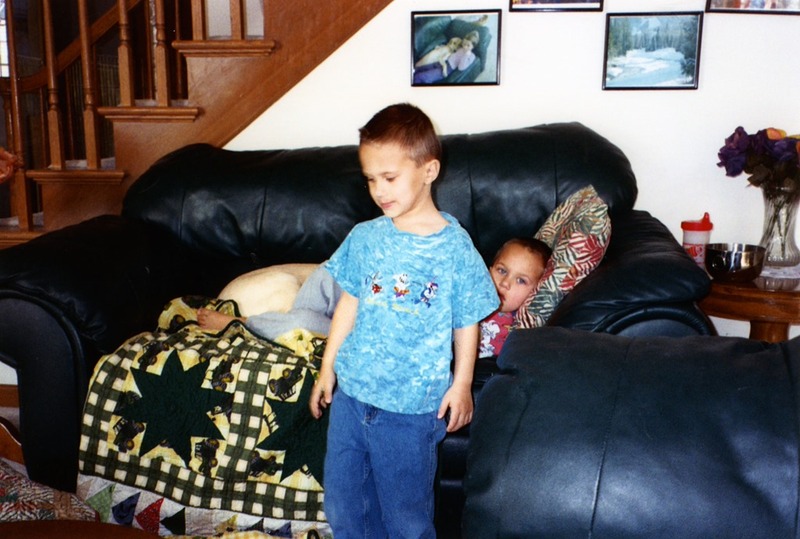 They are right under a picture of Jakki and Fran lying on that same couch. I guess in the end they were in the irony stage of development. My original family history project was printing all the pictures I could and hanging them around the house. We don’t do that as much now as we did then. We have maybe 100 pictures on the wall. But for a time I would print them, rotate the pictures and hang them on the wall in the living room. Those were the days I guess. Tell us of the great journeys we took when we were little, dad. 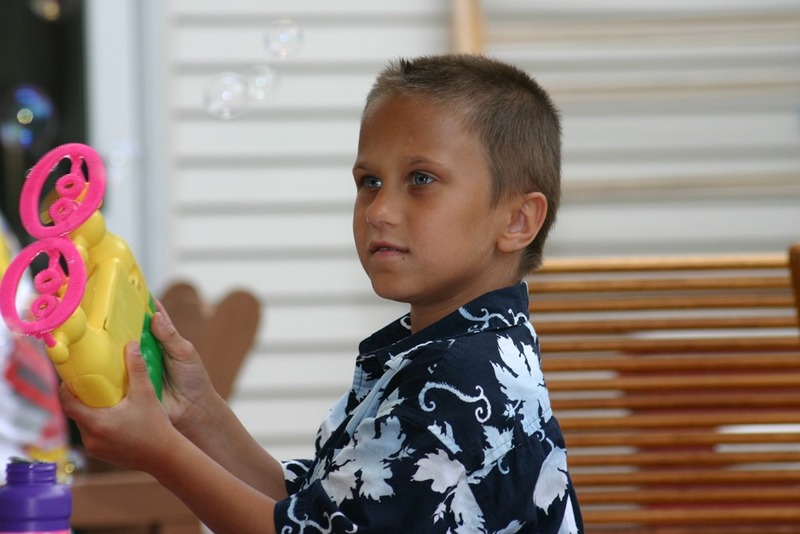 This is one of my favorite pictures of Nick when he was little. On the beach at Xcaret (Cancun Mexico). Covered in sand standing inside the yellow. Behind him the wonderful beach at Xcaret. A place you can’t have sun screen or anything unnatural on you, it is q place for the permanent residents not the visiting humans. I love this pictures. It has been framed and hanging on our wall for years. (well 10 years). I feel like “Puff the Magic Dragon” sometimes because the little boys in the pictures I’ve been sharing aren’t little anymore. Lukas is about an inch shorter than I am and Nick is about 1.5 to 2 inches shorter than me. I was taller than my dad when I was 17, and we are coming up on that milestone in about a month for the boys. As parents you arm your children with the intelligence to face the world, the compassion to care about those around them and the love and understanding that other people and they will make mistakes. That is a parents job. Raising children is hard work. But it is also a wonder and joy that fills your heart with moments you will never forget. Plus you get to hang out and watch some pretty cool people grow up. 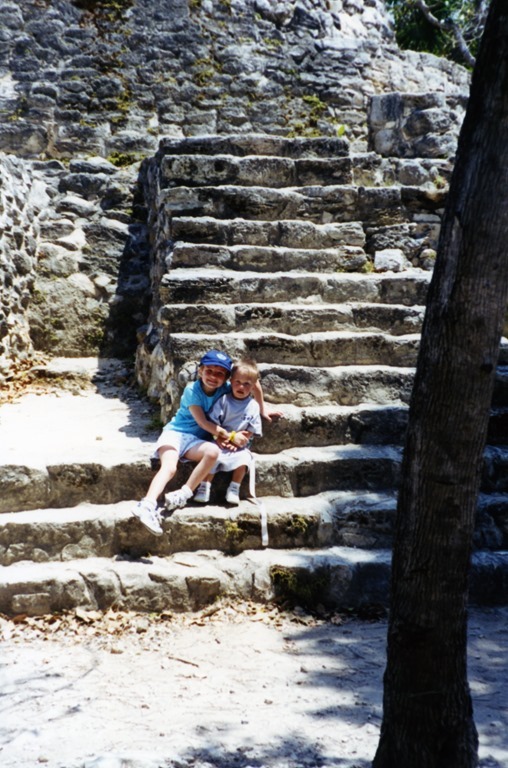 The same picture I shared recently of Jakki on the Mayan temple stairs. The first one shows Jakki and Nick perched on the stairs ready for adventure. The second picture shows poor Luke conked out. 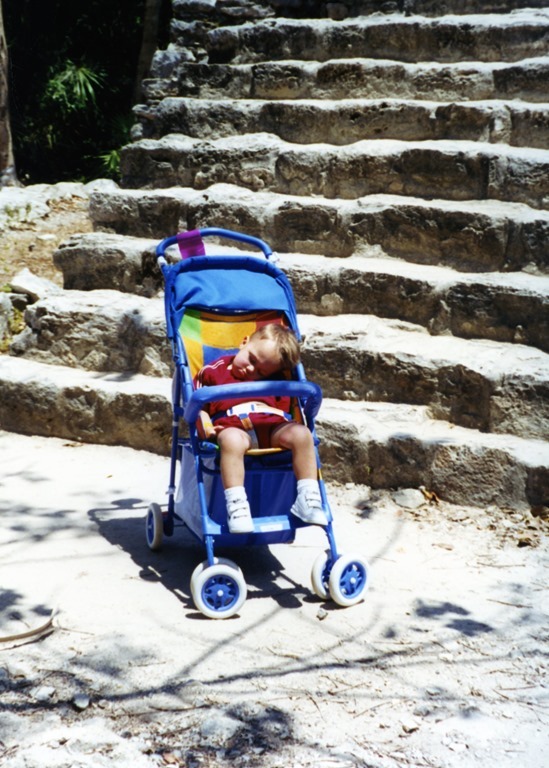 We ran that day at Xcaret. We wandered around the sand and wondered at the animals and the buildings. We sat by the ocean and just had a blast. And of course we zonked when we needed to. Our family vacations often involve going to the ocean. That is a big East Coast thing – you go to the beach when you have time off. I guess even though we grew up in the Midwest we were destined to be East coasters. Bound for the ocean on vacation. Honking our horns and cutting other drivers off. Because our vacation (or work) is the most important vacation or work on the road. (That last bit may be harsh but sometimes it feels like drivers are too aggressive in the DC area). Side note between posting my blog yesterday am (around 10 am I run late on the weekends) and this mornings post we had 10 inches of snow. The boys, Jakki, the dogs and I all went for a walk in the snow yesterday afternoon. We had the incredible opportunity to spend an afternoon at Xcarate. What a wonderful place. 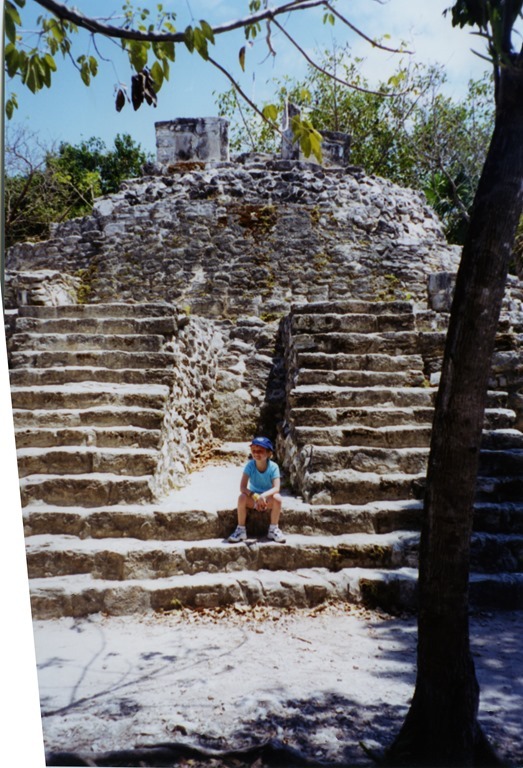 Here is Jakki perched on the steps of an actual Mayan temple. 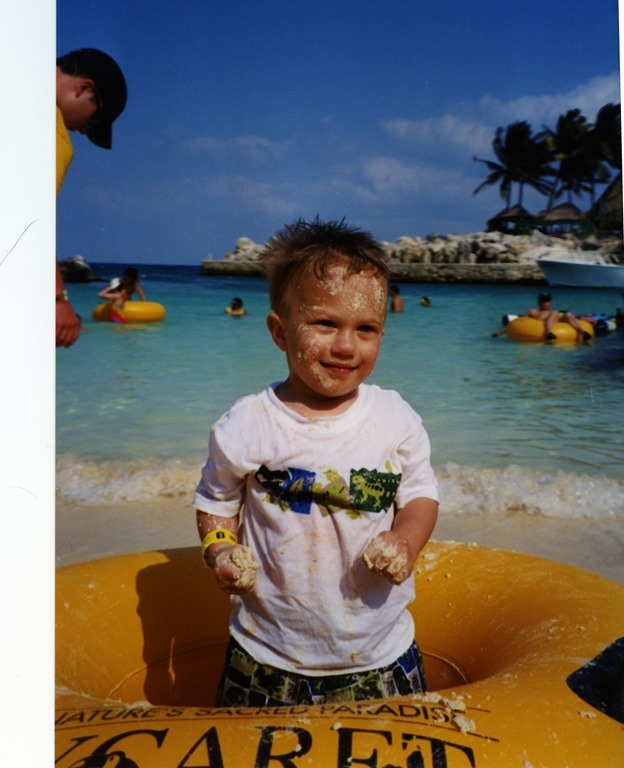 I was a fantastic about the Mayan and Aztec cultures from a very early age. I made my grandparents take us to Azetlan a place in Wisconsin where they have discovered Aztec tools and materials meaning that the Aztecs could have had a much larger empire than originally projected. The Mayan’s predate the Aztecs and frankly based on their calendar I loved their civilization. The thing that drew me in first was the fact that the world ended on my birthday. 12-21-2012. The world didn’t end that day in fact it was a fairly nice day in Maryland – no snow. My world came to a crashing halt the next day (12-22) when I came down with an inner ear infection. Maybe what the Mayan’s were projecting was the end of my non-ear infection days. What an amazing culture building these amazing buildings and then for all intents and purposes stopping. There are still people that can draw their genetic heritage back to the Mayans but for all intents and purposes their culture ended long before the Spanish set foot on the new world. There is another version of this picture with Jakki and Nick. I like this one because it show the entire temple and where Jakki was in relation, the one of her and Nick is more of a close up. 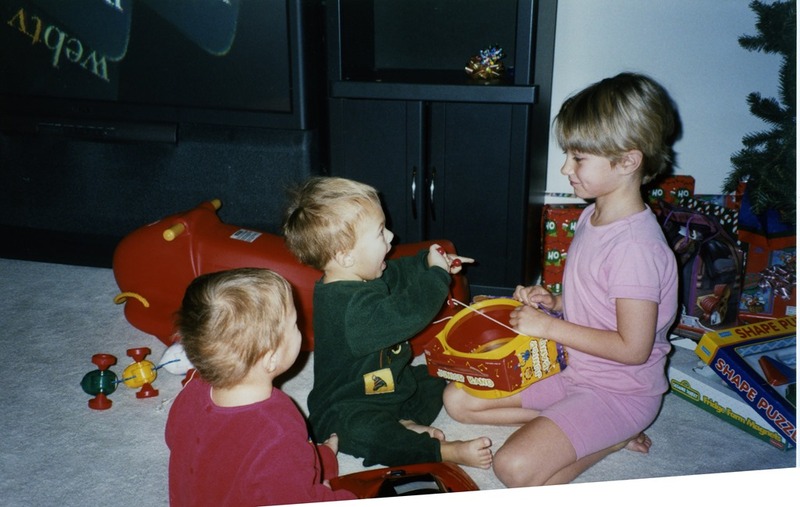 As you can see from this picture taken from Willowcove Cincinnati Ohio (we didn’t have a living room or a dining room in the house we had a couch and a massive toy room) even back then they loved playing any game with Jakki. They still do to this day. They delight in hanging out with their big sister. When they started playing video games they really wanted initially to beat me. Then the most important goal of video games was to beat Jakki. They became quite adept in the end at taking me out. Jakki however, gamer girl!, can in many games still kick their buts. She has wisely learned to stay away from the boys when it comes to first person shooters for the most part. They tend towards quick and effective at those games. But the simple joy they have found with their big sister is amazing. Of course she puts in the time and effort to be a part of their lives so you get what you sow as my father always used to say. “Look ma no hands.” Finally because it is cold and I am so tired of snow, we will end today with a picture of the summer. This is taken from the terraced yard area towards the pool and beyond the pool the pond at hour house in Indiana. Barb found those swim suits for the boys early on. They kept their heads up right so that when they went in the water they didn’t have to struggle. They quickly using those suits gained confidence and we later had a person giving lessons in our pool for them. They are pretty good swimmers. Mid-jump Nick is neither on the diving board or in the water. I suspect if he were a cat we would have included a box in this picture so that we would never know – does he stay in mid-air or land in the water?